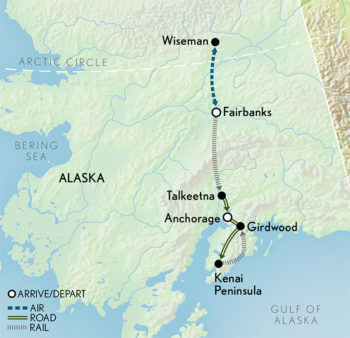 Immerse yourself in the epic grandeur of wild Alaska, as you view stunning Denali National Park from a deluxe domed railcar, walk across the face of a glacier, and meet Alaskan sled dogs up close to learn how a team is prepared for the Iditarod. Arrive in Fairbanks, where you are met and privately transferred to your hotel. Tonight, gather with your fellow guests for a reception and welcome dinner. Board a small plane for a sightseeing flight (weather permitting) that carries you over the majestic Brooks Range to a landing above the Arctic Circle, in the tiny town of Wiseman. Tour this far-flung outpost with a local guide who shows you the nearby Trans-Alaska Pipeline, a marvel of engineering, and the Koyukuk River, a tributary of the mighty Yukon River. Return to Fairbanks for an evening at your leisure. This morning, it’s “all aboard” a deluxe dome railcar for a scenic ride through Denali National Park. Enjoy breakfast and lunch as you take in the passing vistas of Denali’s pristine forests and snow-capped mountains. Arrive in Talkeetna, a quirky village said to have inspired the TV series Northern Exposure, and transfer to your hotel. Board an airplane for a flightseeing adventure to the remote western end of Denali National Park for marvellous views of Denali as well as Mount Foraker and Mount Hunter. Continue over the Kahiltna Glacier to the climbers’ base camp, where you land and step out on the glacier (weather permitting) for an exhilarating wilderness experience, before returning to Talkeetna. Enjoy your afternoon at leisure, explore on your own or choose from optional activities like fishing, ziplining, biking and hiking. Tonight, gather with your fellow guests and A&K Resident Tour Director for a Scenic Sundowner, as the sun sets outside your lodge. Set out for Girdwood, stopping en route to visit the kennels of four-time Iditarod champion Martin Buser. Go up close with members of his Alaskan husky sled-dog teams, and enjoy lunch on site. Then, proceed south along the Seward Highway to Girdwood, an inviting resort community at the base of Mount Alyeska. Cap your day with a ride on the Scenic Alyeska Tram, summiting the mountain to take in the glorious vistas of the surrounding countryside. Enjoy an evening at leisure at your resort. Journey along scenic Turnagain Arm, through forests and across coastal flats to Seward, keeping watch for Dall sheep high up in the rocky cliffs. Next, board a boat and cruise into Kenai Fjords National Park, where you view massive glaciers and keep an eye out for whales, sea otters, walruses and other marine wildlife. Enjoy lunch on board before returning to the harbour. Next, board the Alaska Railroad dome rail train for the return to Girdwood, marveling at the natural scenery and enjoying dinner on board. Lift off by helicopter for an alpine camp in the mountains, where you land and set out on a sled-dog tour across a snow-covered glacier. Learn the basics of mushing from the experienced guides accompanying you, drive the sled yourself or just enjoy the ride. Learn as you go about the training regimen for Alaskan huskies as they prepare for the Iditarod. This afternoon is at your leisure to relax at your resort hotel. Set out for the Alaska Wildlife Conservation Center, where you enjoy an up-close visit with the native Alaskan species being rehabilitated there, including bison, moose and grizzly bears. Continue to Anchorage for a city tour featuring Lake Hood, a waterway frequented by seaplanes. Also visit Earthquake Park and view the historic downtown area. Tonight, gather for a farewell dinner. Transfer to the Anchorage Airport and depart.